SKF NOTE: When Jim Keltner called me at Modern Drummer to ask if we would be interested in interviewing his friend, Jim Gordon, the answer was an unequivocal yes. It was a time when we MD Editors felt, to an extent, as if we were playing catch up securing interviews with the long line of drummers we felt deserved interviewing. 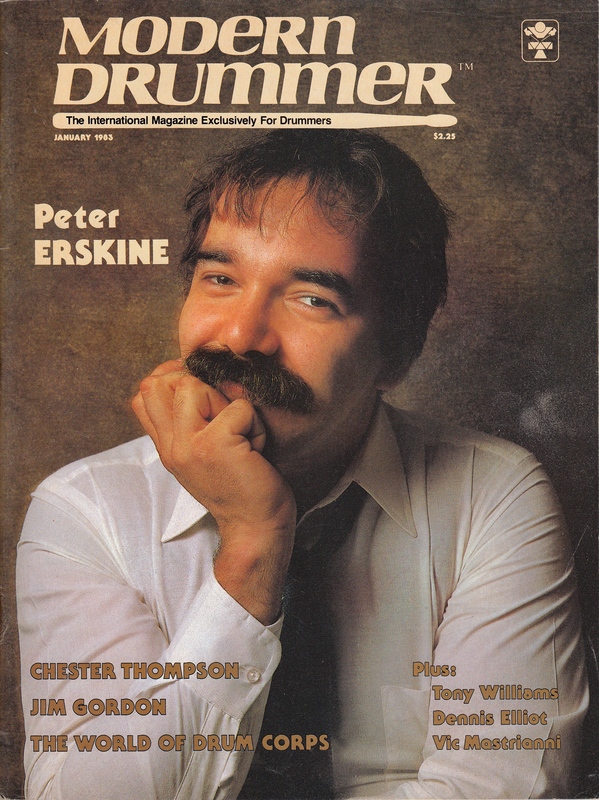 I’ve said it before, but it bears repeating: before MD there were few published indepth interviews with drummers. What I didn’t write in my 1983 introduction to this interview is that Keltner was asking about MD interest in a Jim Gordon interview for two reasons. Gordon’s career, of course, was enough to warrant a MD feature interview. But Keltner was also asking because he thought a MD interview might raise Gordon’s spirits. Gordon was feeling very low. In fact, five months after this interview was published, Jim Gordon murdered his mother. A very sad, tragic event in a remarkable music career. Also, MD‘s yes was no guarantee Jim Gordon would say yes. But if MD was interested, then Keltner would float the idea with Gordon. I don’t remember if I called Jim Gordon the night of this interview or if he called me. What I do remember, vividly, is that it was after normal work hours and I was alone in my room at the rooming house where I lived. I was neither expecting to interview Jim Gordon at this time, nor had I done any preparation for this interview. That is, I was familiar with Delaney & Bonnie, Joe Cocker’s Mad Dogs & Englishmen, Derek & the Dominos, Gordon Lightfoot — but I hadn’t time to study Jim Gordon’s musical career. Ideally, I would have listened to as much as possible of his music, and read as much about him, prepared a list of questions/topics, before interviewing him. But, as I say, there was no guarantee Jim would say yes to an interview. Our phone conversation this night was, in my mind, an introductory phone call. At first, I’m sure my goal was to gain Jim Gordon’s confidence and to set up a later day/time for our interview. So when Jim was ready for an interview that night, I scrambled, not wanting to tell him I wasn’t ready, only to find out another day he had changed his mind. Fortunately I had a small cassette recorder, a land line telephone, and a Radio Shack suction cup mic on hand. I don’t think I had any blank tapes. Instead, I think I reused a couple of cassettes on hand. I asked Jim Gordon my first question and then, as I like to do, just listened. Just let him talk and let the tape roll. I based my questions on what I knew about Jim Gordon, and thought of new questions based on the story Jim was telling me. For example, I was familiar with Gary Puckett & the Union Gap, Mike Post, Larry Bunker, and other people and things Jim spoke about. Finally there was the issue of photos to accompany this feature interview. Again, we ran into whether or not Jim Gordon would be okay with a stranger/photographer taking a series of photos. We were also running up against the clock. If MD was going to publish this interview as scheduled, we needed photos. Jim Keltner, I believe, suggested his son, Eric, take the photos. 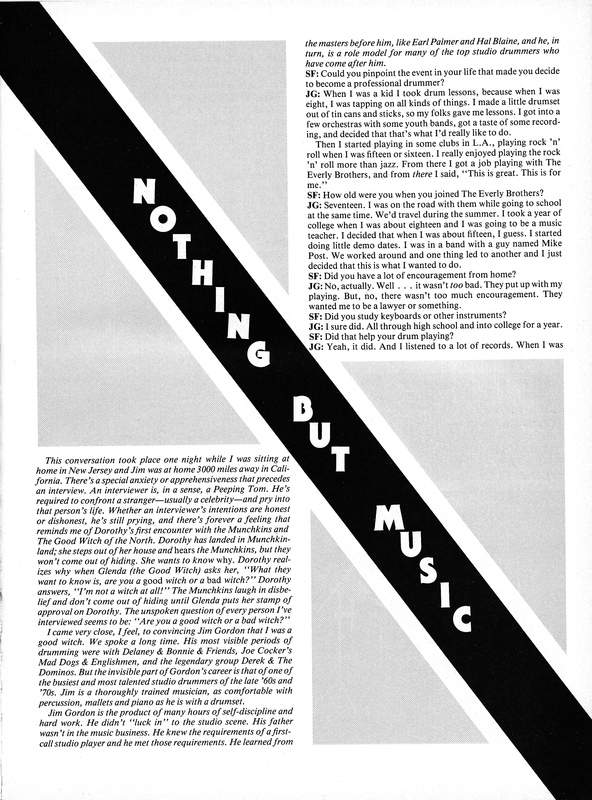 Eric was a young guy, but MD had used his photos in the November 1981 interview with his father. So I gave Eric Keltner the green light, Jim Gordon was okay with Eric coming to the house and taking photos, and those are the photos we used. 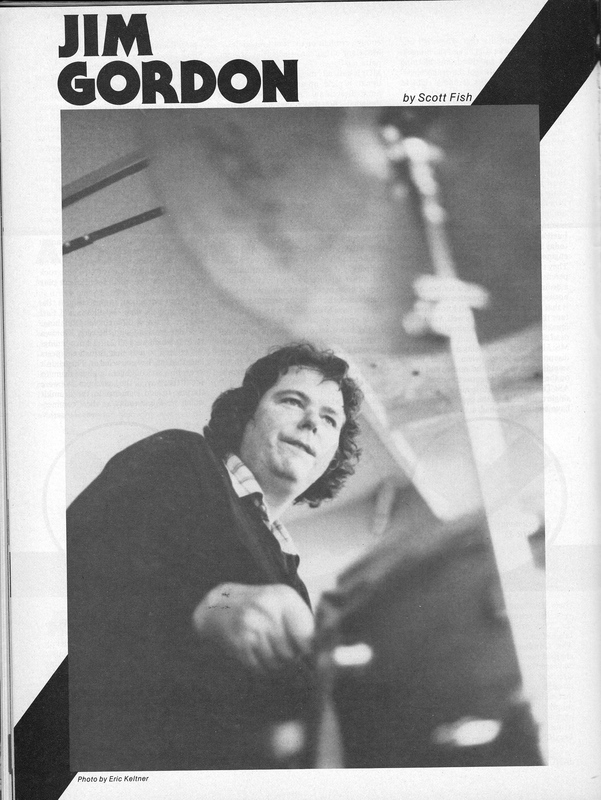 This entry was posted in SKF Blog and tagged Drummer, Jim Gordon, Jim Keltner, Modern Drummer, Scott K Fish. Bookmark the permalink.